The hox gene in this example shows how it distributes each body part. Paleontology: The scientific study of prehistoric life. Genetics: The study of the units of heredity called genes. Paleontology is another huge subset of evidence that could support the theory of evolution. Evolution can be easily supported by the evidence of looking at prehistoric animal fossils up to today’s animals. You can take a look at the changes that have been made through time because of the factors that affect that certain species. Looking at the genes of the animals, this shows what the animals were a like, and gives information on how the animals would look like as well. Looking at the genealogy on the animals and looking at their heritage, you could see relevant facts that help support evolution. Because genes describe how something is suppose to mentally, as well as physically look, this would be hand and hand in paleontology and help scientists know what they’re looking for. The Hox gene is a gene that every living organism shares that connects them. This gene dictates what the organism will grow up to be and look like. The gene changes and forms during the formation of the embryo. This connects it to embryology and morphology also. Hox genes are like the instructors for the head- tail information. “Head goes there.” Tail goes there.” Some “control” genes are common to many organisms; they are homologous—inherited from our common ancestor. Embryology: The study of how the embryo forms through time. When the egg is fertilized, an embryo will start to form, but how does the embryo know what to form as? How does the embryo know not turn into a fly, but into a human baby? Like mentioned above, the Hox gene decides this. The neat things is though, the Hox gene is the same exact gene that forms the body in every living things. They are completely identical. The first hox gene was discovered in Drosophila. Mutation in this gene leads to the formation of a normal structure or organ in place of another at an abnormal site. 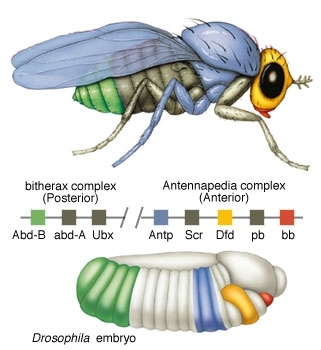 For instance, mutation in antenapedia hox gene of Drosophila leads to the formation of leg in place of antenna from its head. Eventually, other hox genes were identified in other organisms, such as in reptiles, vertebrates and plants. The first vertebrates hox gene was isolated in Xenopus by Eddy De Robert is and colleagues in 1984. Inplants, one of the well known homoeotic gene is the MADS-box genes.